“Up until now, it has not been possible to create electrodes that are this thick and which still allow the lithium to be transported fast enough” to provide fast charge-discharge characteristics, he said. 24M seeks to solve that problem through “a combination of the physical arrangement of the charge material within these electrodes, and the material we actually use,” he said. That’s accomplished in the single-step process by which 24M layers its anode and cathode materials together, with an electrolyte material in between. “The electrolyte lies between the two layers, but it also permeates both of the electrodes. It’s infused into both the cathode and the anode. That’s necessary for the lithium ions to get out of the back of the battery,” he said. The end result is a battery cell that combines high energy capacity and high current density in the same set of materials, he said. 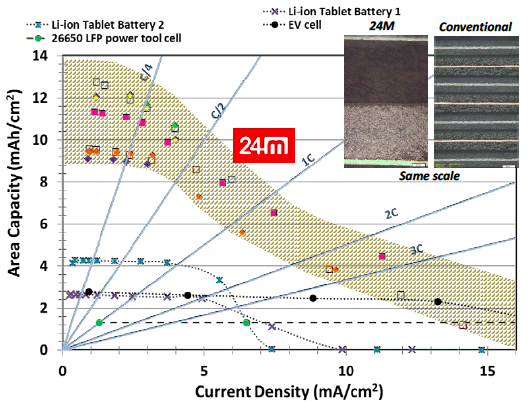 The following graph, which shows a 24M test cell’s range of performance across different states of charge and discharge via the tan, as compared to typical lithium-ion batteries for power tools, tablets and electric vehicles. “We believe these to be the safest lithium-ion batteries ever created,” he added, largely due to the lack of brittle, breakable separator materials within the battery cells. To prove that, 24M shared a series of photographs of a test pouch cell being folded up like an accordion, while still maintaining a constant state of power output. “Throughout the whole series of folds, it never creates an internal short circuit; it still works at the end of it, and after we were done, we left the battery on the shelf for a month and it still worked,” he said. That’s not just a safety bonus -- it also shows that you can shape the battery, which offers potential advantages in terms of how cells are designed to work in different form factors, he said. “The second aspect of lithium-ion technology that we felt needed to be reconsidered is the whole manufacturing process,” Chiang said. “Why does a conventional lithium-ion battery plant have to be so expensive and so large? To get in the game, you need at least half a billion dollars,” or at the grand scale of Tesla’s Gigafactory, up to 10 times that amount, he said. At the root of this high cost and complexity is a multi-stage manufacturing process that hasn’t fundamentally changed since the late 1980s, he said. First of all, a conventional lithium-ion battery plant starts with metal foil, and then layers liquid “ink or paint” on it to form its electrodes, he said. That coated metal foil then has to be dried in a series of ovens, before it’s sent off for further processing, including the use of solvents that have to be recovered for reuse on the next round of products. At the same time, “these electrodes do not have any exotic, costly components in them,” he said. “Everything they use is already in the lithium-ion supply chain.” And because all the materials that 24M puts into the process end up in the final product, there’s no need to remove any chemicals along the way, he said. Others have tried to adapt similar manufacturing processes to the battery business before, he noted. “For example, people have tried to make extruded batteries,” he said, but “they had to have so much plastic to make that process possible, by the time they’re done, they have a ton of inactive material and a really poorly performing battery.” That’s in contrast to 24M’s process, in which “what goes into the electrodes is just what we need to [allow them to] perform their function,” he said. There’s plenty about how 24M gets its layers of anode, cathode and electrolyte to form this perfect blend of battery performance characteristics that Chiang didn’t reveal in this interview. But he did say that the startup has put together a set of methods that can be replicated in a production environment that’s much, much simpler than the processes used to make lithium-ion batteries today. Even so, “the equipment to make this stuff is fairly simple,” he said, using commercial off-the-shelf gear in common use in today’s battery manufacturing plants, as well as from industries with less of a reputation for cutting-edge technology, like the food industry. The end result, he said, is “a different way of thinking about how to scale production to high volumes. In this field, success means there will be many, many gigawatt-hours of batteries produced every year. We believe the most cost-efficient way to get there is to create manufacturing modules that you can just replicate,” he said. In bottom-line terms, “We can get almost all the economies of scale with a $12 million factory” that would require a $500 million factory today. 24M and its unnamed manufacturing partner are “designing and developing a mini-plant, which can be replicated by using a copy-exact model” along these lines, he said. Fewer individual process steps along the way mean fewer opportunities for something to go wrong as 24M scales from prototype-scale to commercial-scale production, he added. The startup plans to build its utility-scale batteries in partnership with its strategic investors, rather than licensing the technology itself, Wilder said. It’s already working with unnamed potential customers, one of which has about 75 megawatt-hours per year of demand-charge management business to fulfill, and another that’s looking at hundreds of megawatt-hours per year of utility-facing energy storage project business, he said.